Alexandra Boutros, in her article, “Virtual Vodou, Actual Practice: Transfiguring the Technological,” examines the intersection between virtual interaction and Vodou practice, and how practitioners navigate technology and popular depictions. She writes: “digital technologies—the possibilities and limits generated by the interaction between technology and technology use—shape manifestations of Vodou in the digital public sphere” (2013, 239). 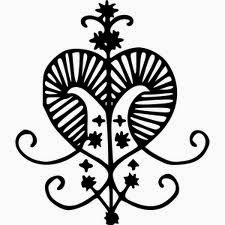 That is, there are now practitioners of Vodou who have no national or genealogical connection to Haiti and thus Vodou, but who nevertheless have become immersed in its virtual community. Boutros states that the intersection between religion and technology is often framed negatively; technology somehow dilutes or diffuses the notion of an “authentic” religious experience (and yet again, we bump up against the idea that “legitimate” religion is solely defined by an inwardness and sincerity). Yet there are many religions developing an online presence in the face of the overwhelming amount of virtual interaction increasing in the modern world. Examples range from; Ask The Imam and Catholic virtual confession app for smartphones, to new religions such as pagan technomysticism, and even religions that are born online through chatrooms, such as therianthropy (do watch the short video below, it provides a succinct description of how this fascinating movement emerged). Boutros examines how these virtual spaces intersect with religion, but I would like to back up a bit to look at how grounded (quite literally, in many ways) Vodou is with Haiti in the first place, in order to then to consider Boutros’ comments. Karen McCarthy Brown (perhaps best known for her book Mama Lola) writes in her article, “Staying Grounded in a High-Rise Building: Ecological Dissonance and Ritual Accommodation in Haitian Vodou,” that when Africans were enslaved in Haiti their homeland became spiritualized (1999, 82). Practitioners wishing to call upon their spirit ancestors draw a cornmeal veve on the ground of temples or shrines, directed at specific spirits. Veve are considered a passageway through the “watery subterranean world they call Ginen” to a spiritual African homeland (81). The veve’s intersecting lines have cosmological meanings, as McCarthy Brown writes: “It is both a crossroads, the ritually accented place where two roads meet at right angles, and a map of the cosmos itself; both a reference to an intimate corner of human-scale space and a cosmogram” (1999, 82). The dilemma of “feeling rooted” then prompts a variety of practices that transpose Haiti in New York and other North American cities. One example is where a Priestess placed a tub to collect the water, rum, and perfume libations that were poured to the spirits. She then bottled the liquid in small containers, which practitioners took home to then spread the “bath” on their skin over three days, without washing, in order to absorb the liquid. The porousness of skin has replaced the absorbency of the earth. McCarthy Brown observes: “In theory, at least, one could feed [the spirits] as well through the skin as through the earth” (86). 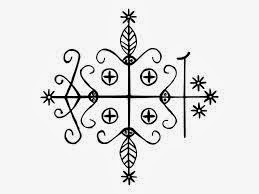 Haitian Vodou, then, literally inhabits the earth, and this has cosmological, practical, and even national implications in the diaspora. Boutros is addressing the next step: from Africa to Haiti to North America to the virtual world. She states that as Vodou has become more publicly visible and acceptable, as well as its legal recognition in Haiti, has opened up the secretive and guarded religion to the public sphere (240). As non-Haitians become interested, their connection the earth in Haiti in then negotiated in various ways. We may eventually view virtual spaces as benign to the religious experience, its integration into our everyday lives becoming so commonplace that it is no longer considered a threat to our perceived notions of “authenticity.” But as a new technology, is it yet another medium to navigate our religious experiences (such as texts, rituals, images, sounds, our own bodies, and other media). The experiential is always at the centre of how we self-define our religious notions, and virtual interaction is yet another way to mediate that experience: discuss, dissect, advise, consult, and promote our ideas. It is interesting to note that there is a significant amount of members of the Church of Satan who were also drawn to seek more information because of depictions of Satanism in the media, films, and heavy metal music. This differs somewhat from pre-Internet members, who sought information through occult bookstores and/or various New Age types of activities and groups, wherein pamphlets, leaflets, periodicals, newsletters, and bulletins produced by various Satanists for various purposes (magic, fiction writing, essays on Satanism, promoting a particular local cabal to national members, etc.). The difference is the initial level of commitment and certainly the ease of access. Some Satanists of the older generation lament that what they call First Phase Satanism (an overly enthusiastic and sometimes misguided interest in Satanism) is on the increase with virtual interaction, whereas before, it took a certain amount of genuine effort to actually write a letter, partake in a cabal, or attend an information session. Boutros, Alexandra. 2013. “Virtual Vodou, Actual Practice: Transfiguring the Technological,” in Jeremy Stolow, ed. Deus in Machina: Religion, Technology, and the Things in Between. New York: Fordham Universty Press: 239-259. Brown, Karen McCarthy. 1999. “Staying Grounded in a High-Rise Building: Ecological Dissonance and Ritual Accommodation in Haitian Vodou,” in Robert A. Orsi, ed. Gods of the City: Religion and the American Urban Landscape. Bloomington, IN: Indiana University Press: 79-102.